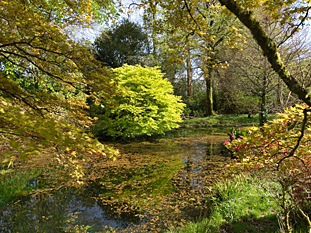 Redruth 30 acre woodland garden alongside a large working nursery. 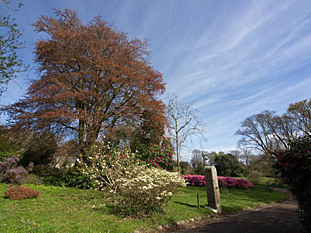 The drive from the Lodge at the front entrance to Burncoose House is about a quarter of a mile long running almost due north to south with the garden going down to an area below the house where there is a pond and boggy area. At no one point does the garden exceed more than a few hundred yards in width. Probably the most important date in the life of Burncoose Gardens came on the night of 18th/19th December 1979. A strong wind was blowing all day on the 18th but we were woken in the early hours to the worst gale ever. We spent the night in darkness listening to the trees crashing down one after another and at first light we went out to a scene of absolute devastation. The main drive was blocked for nearly a third of its length with over a hundred trees piled one on top of another. It took nearly three months just to open the drive and five years later we cleared the last tree. Up until 1984 when the Nursery opened at Burncoose, apart from the occasional fetes and open days the garden here was completely private and rarely seen by anyone other than invited guests. Since the late 1950s the 30 acre garden was being very well maintained by the Head Gardener, Mr Arnold Dance, and it must have been a great intrusion when we arrrived. 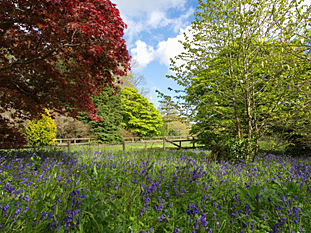 Much of the charm of Burncoose Gardens is the carpets of bluebells, daffodills, primroses, snowdrops and wild violets which grow in abundance in the late winter and spring, and we have been careful not to spoil this natural effect. We have tried to keep the woodland garden as informal as possible. There are many delights to see in the garden at Burncoose which is open to the public most of the year and even in the summer and late autumn we have a fine collection of hydrangeas which, on our acid soil, flower the most intense blue and purples. Burncoose Nurseries are situated directly on the main A393 Redruth to Falmouth road between the villages of Lanner and Ponsanooth. The best route to the Nursery from the A30 is via the Scorrier turnoff and then Carharrack on the B3298. Do not go into Gwennap Village or Gwennap Pit.